At Biotium, our specialty is creating fluorescent dyes that simplify and improve your scientific experiments. 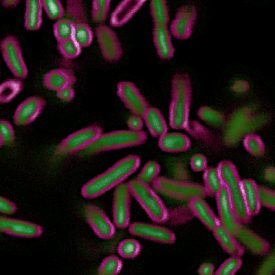 For Microbiology, we offer a wide range of fluorescent dyes and assays kits to stain bacteria, yeast and fungi, including dyes to assess cell viability and bacterial gram stain type. We have also developed a complete toolkit of reagents for viability PCR, a revolutionary method for determining microbial viability using qPCR. Also visit our Cellular Stains Table for a comprehensive list of cellular stains with their ability to stain various cell types. 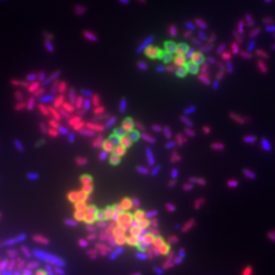 For bacteria, we offer fluorescent dyes to stain live cells, dead cells, and gram+ cells. Combining these dyes in multi-color microscopy or flow cytometry experiments allows several parameters to be assessed at one time. BactoView™ Live, RedDot™1, DMAO, Thiazole Orange, and Hoechst are cell membrane permeant nucleic acid binding dyes. SynaptoGreen™, SynaptoRed™, and CellBrite™ Fix are all cell membrane/cell periphery stains. CellBrite™ Fix dyes are a set of fixable membrane dyes available in multiple colors. 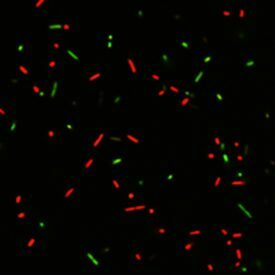 Bacillus subtilis stained with CellBrite™ Fix 555, fixed in paraformaldehyde, and imaged the next day. A traditional colorimetric gram staining protocol is laborious, requiring up to 5 different solutions to stain cells, including toxic alcohol and acetone to decolorize the sample, and precise timing. 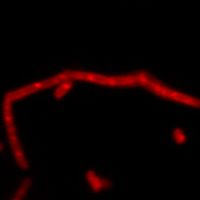 In contrast, Wheat Germ Agglutinin (WGA) has been shown to bind specifically to N-acetylglucosamine in the peptidoglycan layer of the cell wall of gram-positive bacteria, and can be labeled with a number of different fluorescent dyes for one-step fluorescent cell labeling. We offer fluorescent WGA conjugates in 13 color options, as well as combination gram stain/viability kits and DNA dyes. 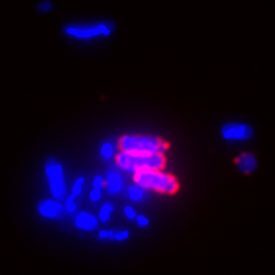 A co-culture of E. coli and Staphylococcus stained with DAPI (blue) and CF®633 WGA (red). Spherically-shaped gram-positive Staphylococcus stain with WGA, while rod-shaped gram-negative E. coli do not stain. DAPI stains all cells blue. Co-culture of E. coli and Staphylococcus stained with CF®594 WGA and DAPI. Gram-positive Staphylococcus show blue DAPI staining and red cell surface staining with WGA, while gram-negative E. coli show only DAPI staining. Heat-killed Pseudomonas and Micrococcus stained with the Bacterial Viability and Gram Stain Kit. CF®488A WGA stains gram-positive Micrococcus green, EthDIII stains dead cells red, and DAPI stains all cells blue. Biotium offers a selection of different fluorescent viability dyes and kits, to allow for the differentiation of live and dead cells by microscopy or flow cytometry (see the Viability PCR section below for detection of viable bacteria by qPCR). A mixture of live and dead E. coli stained with the Viability/Cytotoxicity Kit. 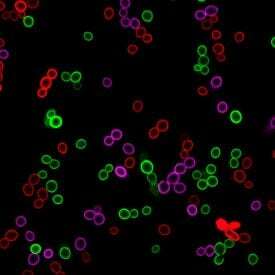 DMAO stains all cells green and EthD-III stains dead cells red. 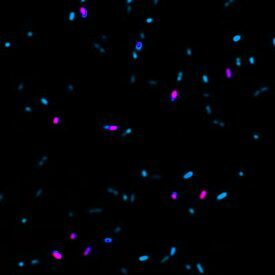 Fluorescent dyes and kits to stain yeast cells, including viability dyes, combination staining kits, and organelle stains. Combining these dyes in multi-color microscopy or flow cytometry experiments allows maximum experimental versatility. 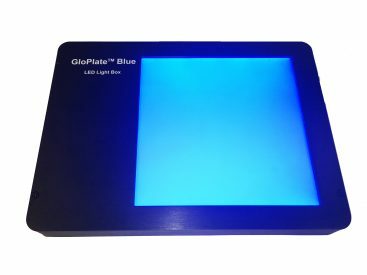 Biotium offers a selection of different fluorescent viability dyes and kits, to allow for the differentiation of live and dead yeast cells by microscopy or flow cytometry (see the Viability PCR section below for detection of viable yeast by qPCR). S. cereviciae stained with the Yeast Vitality Staining Kit: Calcofluor White stains all cell walls blue and ViaVac™ stains the vacuoles of metabolically active cells red and the cytoplasm of all cells green (not shown). 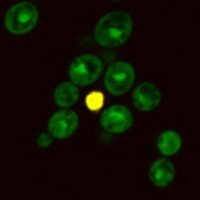 S. cerevisiae stained with the Yeast Live-or-Dye™ Fixable Live/Dead Staining Kit: Thiazole Orange to stain all cells (green) and Live-or-Dye™ 568/583 to stain dead cells (red, appears yellow in overlay). 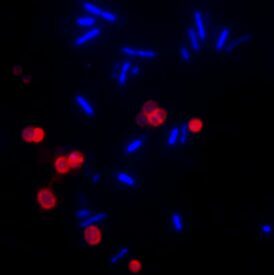 S. cerevisiae stained with the Yeast Viability Staining Kit: CF®640R ConA stains cell walls of all cells with far-red fluorescence (pseudocolored blue in image), while Live-or-Dye™ 568/583 stains dead cells red. 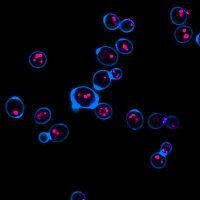 A number of our organelle and cellular stains can be used to stain yeast cells. We also offer stains for the fungal cell wall and bud scars of budding yeast. 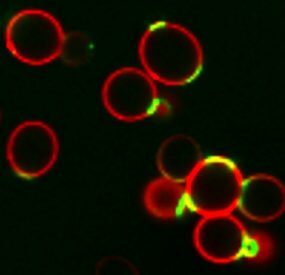 S. cerevisiae stained with CF®488A WGA (green) to stain bud scars and CF®594 ConA (red) to stain the cell wall. 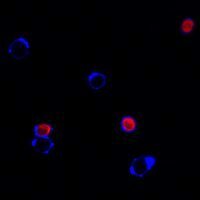 S. cerevisiae stained with LysoView™ 633 to visualize the vacuoles. Imaged on a Zeiss confocal microscope. S. cereviciae stained separately with MemBrite™ Fix 488/515, 568/580, and 640/660. Combined and imaged. 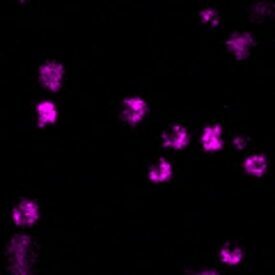 Mitochondrial staining of S. cerevisiae with MitoView™ 633. 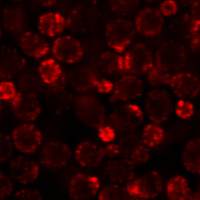 Imaged on a Zeiss confocal microscope. 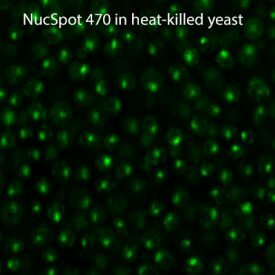 Heat-killed S. cerevisiae stained with NucSpot®470 Nuclear Stain. 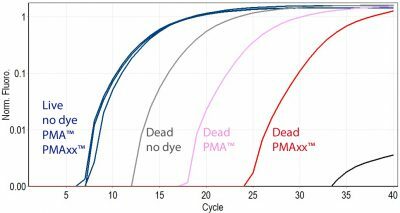 PMAxx™ and PMA are photoreactive dyes with high affinity for DNA. The dyes intercalate into dsDNA and form a covalent linkage upon exposure to intense visible light. PMAxx™ and PMA inhibit PCR amplification of modified DNA templates by a combination of removal of modified DNA during purification and inhibition of template amplification by DNA polymerases. Because PMAxx™ and PMA are cell membrane-impermeable, when a sample containing both live and dead bacteria is treated with dye, only dead bacteria with compromised cell membranes are susceptible to DNA modification. In a real-time PCR reaction, dead cell DNA will show delayed amplification and higher Ct than live cells. In a mixed population, v-PCR permits quantitation of cell viability. PMA is the original dye developed at Biotium for v-PCR. It has been validated in a wide variety of bacterial strains, as well as yeast and viruses (see PMA References). However, while PMA is generally effective at differentiating between live and dead bacteria by qPCR, it does not completely eliminate PCR products from dead cell DNA. This could potentially give false positive results. 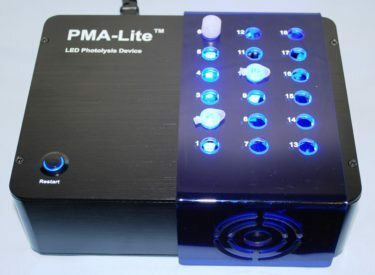 The PMA-Lite™ LED photolysis device allows for time- and temperature-controlled light treatment of PMAxx- or PMA-treated samples in microcentrifuge tubes. Strain-specific v-PCR kits are designed for selective detection of viable bacteria from a specific strain using PMAxx or PMA dye and real-time PCR. The kits contain PMA dye OR PMAxx™ dye, Forget-Me-Not™ EvaGreen® qPCR Master Mix, and validated PCR primers for detection of selected strains of bacteria that are of widespread interest to food safety, public health, and/or antibacterial research. One kit can be used to treat 80 bacterial cultures with PMA or PMAxx™ and perform 200 PCR reactions.